Cut the peppers into quarters, de-seed and grill until blackened and blistered. Place in a bowl, cover with cling film and allow to sweat for a while. When cool enough to handle, remove the skins and cut into long slices. Cut the aubergine in half lengthways and cut into long thin (5mm) slices. Brush with olive oil and place oil side down on a hot griddle pan. When browned, brush the topside with oil, turn over and continue cooking. Set aside to cool. You’ll probably have to do this in several batches. Next top and tail the courgettes, cut into 5mm thick slices lengthways and griddle in the same way as the aubergine. Set aside to cool. Pour the tomato juice into a saucepan, sprinkle over the gelatine powder and gently heat (stirring continually) until the powder has dissolved. Take a 3 pint terrine dish or loaf tin, lightly oil and line with clingfilm. 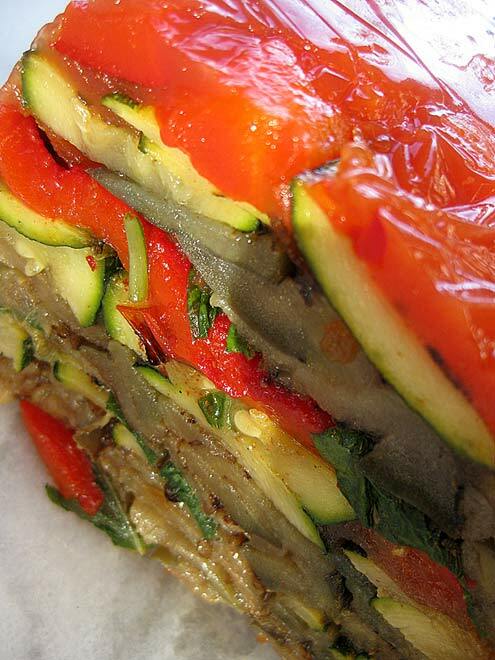 Arrange a layer of peppers along the bottom, then the aubergine and then courgette. Cover with some of the tomato juice, season and top with some torn basil leaves. Repeat this to form several layers making sure you finish with a layer of peppers. 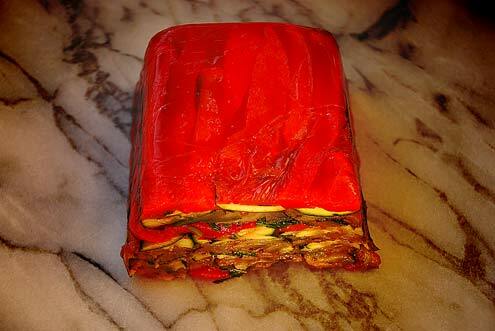 Cover with clingfilm and refrigerate for several hours until set. When ready to eat cut into slices (with a very sharp knife) and pour over some dressing made from mixing together the oil and venegar (4:1). Serve with a crisp salad and perhaps some good crusty bread. Verdict: As terrines go this is quite a hearty beast as the aubergine makes it quite ‘meaty’, but that’s as you’d expect from Mr Wallace. It looks pretty though and tastes good in conjunction with the dressing. It could take a little refining, so if you were to make this I’d suggest experimenting with the recipe. Perhaps substitute the aubergine with asparagus, maybe drop in some peas – I quite like the idea of using a Bloody Mary mix in place of the tomato juice. Drink: A variety of beers and ciders from around the world. Entertainment: “Broadsword calling Danny Bwoy” – an oft repeated viewing of ‘Where Eagles Dare’… excellent stuff.